Oh Heavenly Father, This is the day You have made. I will rejoice and be glad in it. I give you all the praise you for the gift of another blessed day. Your steadfast love never ceases. Your mercies never come to an end. They are new every morning. Lord, you have a plan for me, for my life. Help me to keep the faith and walk steadfast in the ways that you lead me. Guide my thoughts today in the midst of this week, and even as the week progresses, may I always take time to commune with you and praise your name. Father, clear my mind and energize me with purpose and direction. Fill me with love and fire up my spirit with hope and promise. 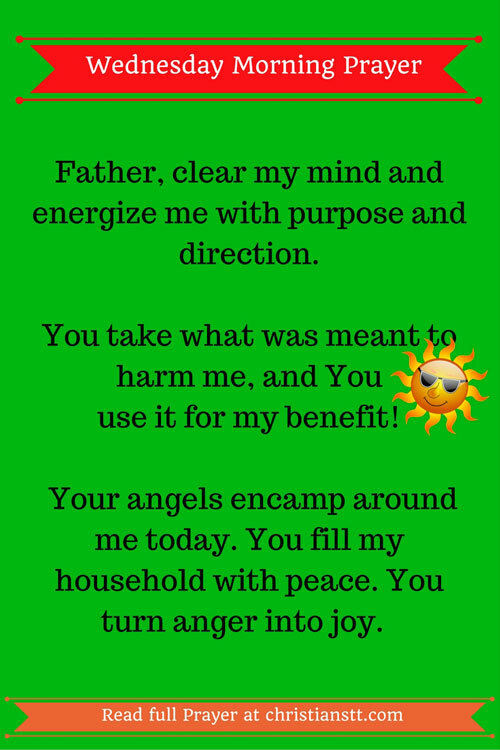 You take what was meant to harm me, and You use it for my benefit! Your angels encamp around me today. You fill my household with peace. You turn anger into joy. Heavenly Father, the burdens of our life seems to overwhelm us at times when we don’t feel to pray or even come out of bed. Lord today, help us to give it all to you. Your word says come all who are weary and burdened and you will give us rest for our weary soul. Lord help us to receive that rest. Father when we don’t know what to do about a situation, let us just turn it over to you because you care for us. Psalm 92:2 It is good to proclaim your unfailing love in the morning, your faithfulness in the evening. Lamentations 3:22–23 The steadfast love of the Lord never ceases. His mercies never come to an end. They are new every morning. Great is your faithfulness. So today, right now, we give everything over to you. Help us to leave it in your hands and rest on your promise to give us rest. Today we choose joy because you are in control. Lord we give you praise for you alone are worthy. You woke us up this morning. Oh, you have blessed us with and so much more you are going to do. And so Lord, take over this day, our minds, thoughts and hearts. W will give you all the praise, honor and glory, in Jesus name, Amen.